Recognizes endogenous levels of Biotinidase protein. Small volumes of anti-BTD antibody vial(s) may occasionally become entrapped in the seal of the product vial during shipment and storage. If necessary, briefly centrifuge the vial on a tabletop centrifuge to dislodge any liquid in the container`s cap. Certain products may require to ship with dry ice and additional dry ice fee may apply. Western blot analysis of Biotinidase expression in mouse liver (A), mouse kidney (B) whole cell lysates. 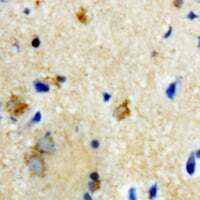 Immunohistochemical analysis of Biotinidase staining in rat brain formalin fixed paraffin embedded tissue section. The section was pre-treated using heat mediated antigen retrieval with sodium citrate buffer (pH 6.0). The section was then incubated with the antibody at room temperature and detected using an HRP conjugated compact polymer system. DAB was used as the chromogen. The section was then counterstained with haematoxylin and mounted with DPX. NCBI/Uniprot data below describe general gene information for BTD. It may not necessarily be applicable to this product. BTD: Catalytic release of biotin from biocytin, the product of biotin-dependent carboxylases degradation. Defects in BTD are the cause of biotinidase deficiency (BTD deficiency); also called late-onset multiple carboxylase deficiency. BTD deficiency is a juvenile form of multiple carboxylase deficiency, an autosomal recessive disorder of biotin metabolism, characterized by ketoacidosis, hyperammonemia, excretion of abnormal organic acid metabolites, and dermatitis. BTD deficiency is characterized by seizures, hypotonia, skin rash, alopecia, ataxia, hearing loss, and optic atrophy. If untreated, symptoms usually become progressively worse, and coma and death may occur. Belongs to the CN hydrolase family. BTD/VNN subfamily. 1. Summary of the demographic features of patients identified as biotinidase deficient from August of 2012 through August of 2013 and mutation analysis results for 20 cases in the southeast region of Turkey.